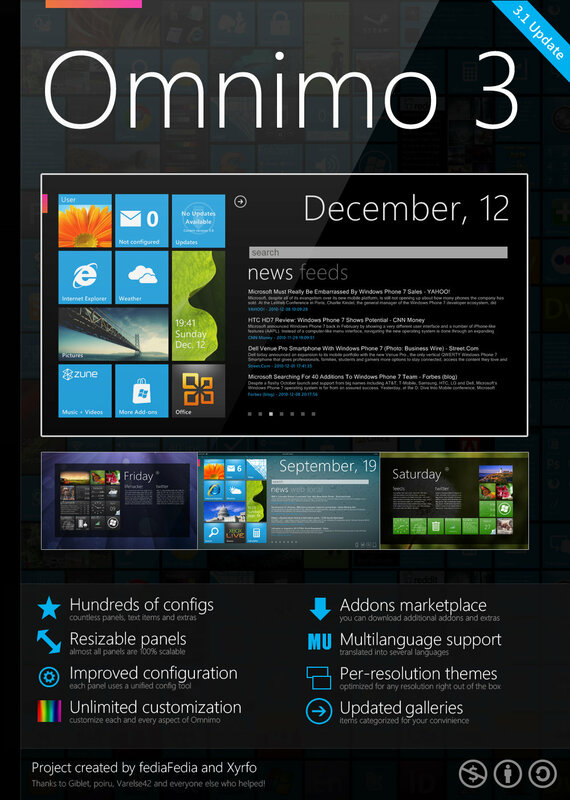 Omnimo is a windows desktop customization tool that overlays your desktop with a beautiful tiled interface similar with Windows Phone 7. It enables you to add useful widgets for weather, Gmail, calendars, news feed, Twitter, system monitoring and many other things to your desktop. The best thing about Omnimo is that you can easily drag and drop the widgets through its setup to customize your desktop depending on your taste and style. Omnimo is Based on the open-source desktop customization tool Rainmeter. So before getting started with Omnimo you need to install Rainmeter on your computer. If you are not familiar with Rainmeter read this post first. After Installing Rainmeter get the latest vesion of Omnimo (currently Omnimo 3.1) from this page. You can find the download link at the top right of the page. Do not forget to close Rainmeter if it is running and double click the Omnimo.rmskin file included in the Omnimo download to install Omnimo. You are almost done! You will see Omnimo’s wellcome message and can choose the panels, skins, and backgrounds that you like from its gallery. To add a widget to your desktop simply click on its icon and move it to the proper place in your desktop with drag and drop. Omnimo can be installed on Windows XP, Vista and Windows 7. Watch this video tutorial to find out more about Omnimo’s features. This entry was posted on May 29, 2011. It was filed under Customization Tools, Windows and was tagged with Omnimo, Rainmeter, Windows Customization, Windows Phone 7.